Be the first to share your favorite memory, photo or story of Sheila . This memorial page is dedicated for family, friends and future generations to celebrate the life of their loved one. 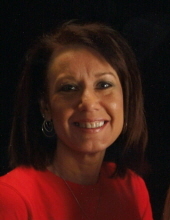 Sheila M. Stelpflug, age 50, of Lancaster, passed away on Friday, January 18, 2019, at Crossing Rivers Health in Prairie du Chien, WI. She was born on August 11, 1968, in Lancaster, the daughter of Lewis and Barbara (Wentz) Hines. Sheila graduated from Lancaster High School in 1986. She furthered her education at Southwest Wisconsin Technical College, earning a degree in Business Administration Finance. On April 29, 1989, Sheila was united in marriage to Michael F. Stelpflug at St. Clement Catholic Church. She was employed at Kinney, Urban, and Kussmaul for several years and most recently with Czajkowski, Higgins, & Tisdale, S.C. in Prairie du Chien. Sheila enjoyed motorcycle rides, dog sitting, crafting, and loved the summer months and being at the river. She dearly enjoyed spending time with family and friends and hosting a good party. Sheila was outgoing and loved attention. Her smile will be greatly missed. Survivors include her significant other, Mike Miller; her children: Samantha, Marissa, Lauren and Jacob Stelpflug; her parents, Lewis Hines and Barbara Bond; her siblings, Rachel (Matthew) Owens and Sarah (Travis) Kirschbaum; nieces and nephews: Hailey and Tyler Hines, Austin and Haily Owens, and Zayn and Haven Kirschbaum; her former husband, Michael Stelpflug; other relatives and many friends. Sheila was preceded in death by her brother, David "Scram" Hines and her step-father, John E. Bond. Funeral services will be held on Thursday, January 24, 2019, at 11:00 a.m. at St. Clement Catholic Church in Lancaster with Father William Vernon officiating. Burial will be held in Beetown Cemetery, Beetown Township, at a later date. Family and friends may call on Wednesday, January 23, 2019, from 4:00 p.m. until 7:00 p.m. at St. Clement Catholic Church and on Thursday from 10:00 a.m. until time of services at the church. Martin Schwartz Funeral Home & Crematory in Lancaster is entrusted with her care. To plant a tree in memory of Sheila M Stelpflug, please visit our Tribute Store. "Email Address" would like to share the life celebration of Sheila M Stelpflug. Click on the "link" to go to share a favorite memory or leave a condolence message for the family.